The hubby and I like to watch TV Cooking Shows and try to make vegan-friendly versions of recipes we like. This practice inspired my Tofu Salad Wraps from an episode of Food Network’s Healthy Appetite with Ellie Krieger. Ellie often features vegetarian meals and tends to focus on whole grains and vegetables. I love how she tells you all about the health benefits of the vegetables she cooks. This was an easy wrap pulled together from my pantry essentials. 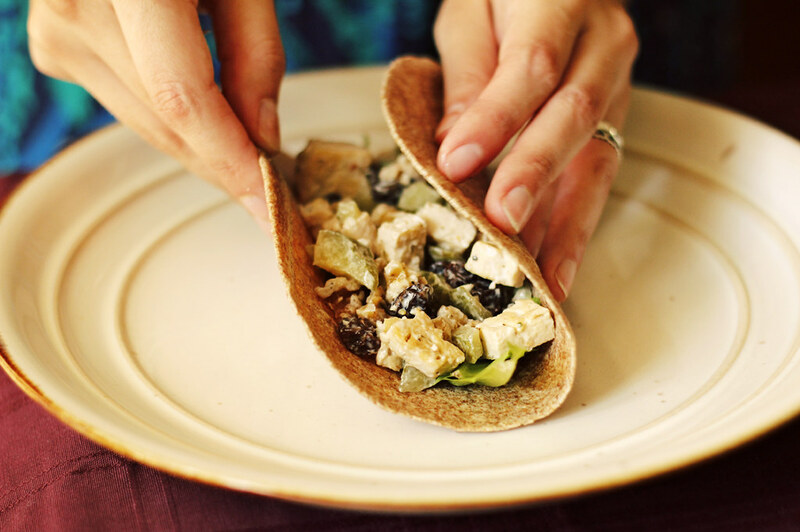 Ingredients: Sautéed Tofu, pickles, raisins, walnuts, spring mix greens, mixed in a vegenaise dressing and wrapped in a whole wheat tortilla.